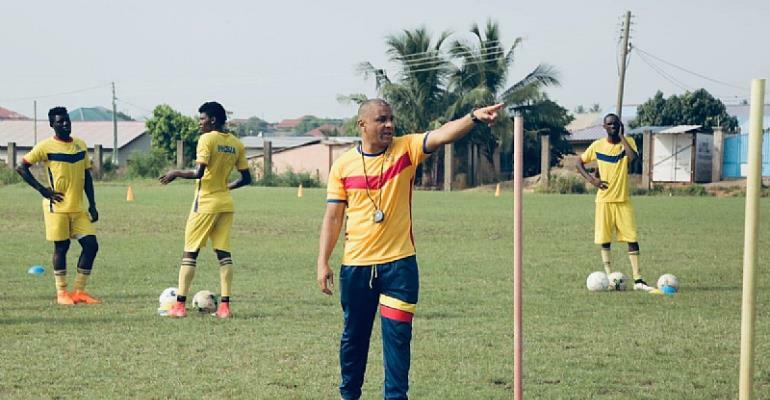 Hearts of Oak Head Coach Kim Grant has set sights on winning their match day 3 encounter with Karela United this weekend in the ongoing Ghana Football Association (GFA) Normalization Committee (NC) Special Competition. The Ghana Premier League giants lost narrowly by a goal to nil to Elmina Sharks yesterday when the two locked horns for the second match of the competition. Kim Grant in a post-match interview disclosed that they are going to prepare for the Karela match over the weekend. According to him, it is a match that they have to win to get back on track if they really want to go far in the competition. “We have had a lot of games in this short period of time and now we must find our feet and lots of this stuff is new for the players as well. Congratulations to Sharks and we just reset, recover and prepare for the Karela Match”, Kim Grant shared. Accessing the Sharks game, the gaffer bemoaned his team’s inability to make use of the numerous chances they created in that game. He believes they were hard done by a counterattack from the opponent which evidently produced the only goal of the match. “We created chances to score we didn’t score. It’s as simple as that. We defended well. We got forward as much as possible and at the end of the day, they just caught us on the counter attack when we were trying to get a goal. So that’s football”, he said. He continued “I believe that we created a lot of chances. We created opportunities. I can say the movement was quite good but like I said we started off slowly at the beginning. We have got Esso who worked really hard, we have got Kofi who has just come into the team, and he is new to the players. We have got Junior, we have got Quayson coming in, look it takes time. Rome wasn’t built in a day and this is a process like I said”. The match between Karela United and Hearts of Oak will be played at the Anyinase CAM Park on Saturday. Kick off time is at 3:00 pm.